Hi, welcome to Blogtails and thank you for your interest. Master Distiller at the Cambridge Distillery and freelance Wine and Spirits Educator. All views here are my own. My last blog looked at Real Ales and the ever-increasing number of micro-breweries bubbling up across the country. This month we’re moving on to the hard stuff as we look at a relatively recent phenomenon: the micro-distillery. It would be accurate, if not insightful, to state that home brewers have paved the way for home distillers. Distillers, however, have a problem: the law. Owning and operating a still of any size or shape is illegal, unless properly licensed. Where the home brewer is permitted an unlimited volume for personal consumption, the default yield for the distiller is zero (NB we take this for granted in the UK, but in many countries home distillers are left to their own devices). Once properly licensed and registered though, the fun can begin. Although numbers are increasing there are still only a handful of micro-distilleries operating in the UK. Most of these concern themselves with vodka and or gin: spirits which require no ageing and are therefore both time and space efficient. 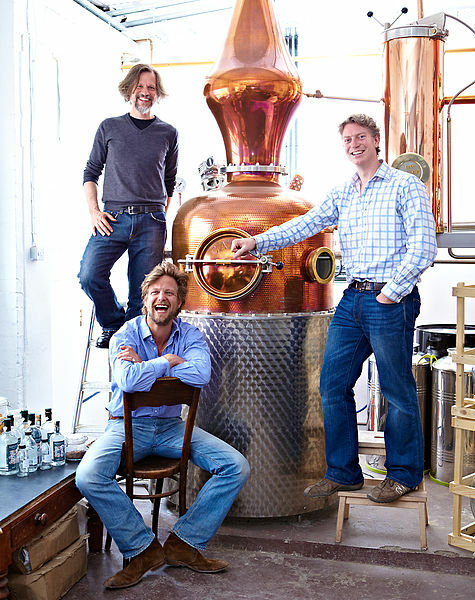 Two small scale operations who have made a big splash are Sipsmith and The Sacred Spirits Company. 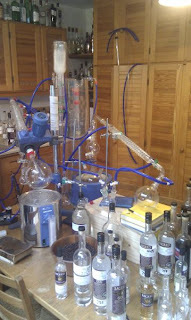 They each have a very different approach to distillation, so we will look at them individually. In 2009 the chaps behind Sipsmith licensed the first copper pot still in London for almost 200 years. Her name is Prudence and she’s a beautiful as she is now famous. Prudence has become somewhat iconic, representing the recent success of small-batch distillers. Sipsmith produce both vodka and gin, as well as the recent additions of Damson and Sloe gin and a summer cup. They have been notably successful in winning hearts, minds and medals, being both highly decorated and widely stocked across not only the capital but indeed the world. The Sacred Spirits Company has an altogether different approach. 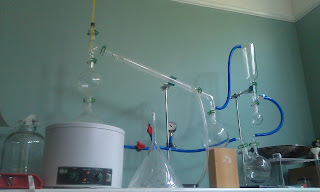 Using a glass still (rather than copper) allows their distillation to be carried out under vacuum. This lowers both the atmospheric pressure and, therefore, the evaporation point, resulting in cool temperature distillation which retains extremely fresh flavours from the botanicals. Each botanical (the fruits, roots, herbs and flowers which give gin its flavour) is distilled separately, then 12 of them are blended together to create their secret recipe which was recognised for its outstanding quality when it won the Gin Masters 2009. 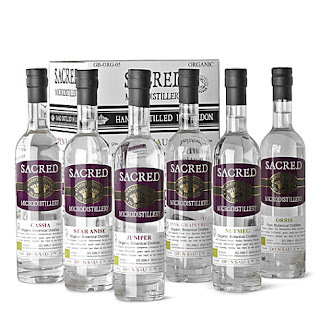 Sacred also bottle and sell individual botanical distillates to allow you to ‘blend your own’ gin. If this is something which appeals then the newest micro-distillery on the scene will definitely be of interest. The Cambridge Distillery is the world’s first Gin Tailor. Operating on the assumption that taste is an entirely personal matter, they make each bottle to suit each individual customer. Rather than producing a standardised blend, a customer books themselves a tailoring session where they are taken through a series of blind tastings by the master distiller. This process is used to ascertain the particular likes and dislikes across a range of distillate flavours. With this done a recipe is blended and tweaked along with the customer until the perfect fit for their palate is found. When perfection is achieved the recipe is scaled up, bottled, then delivered to your door. As well as pretty much guaranteeing you your own ‘perfect’ gin, this makes for an enormously interesting and enjoyable experience. But can small scale distillers ever hope to take on the giants of the market? There are vodka and gin power-brands with worldwide distribution which are household names across the globe – what hope is there for the micro-distiller? An intriguing pattern is developing, and not just in the spirits industry. The food and drink sectors today are concerned more than ever before with the provenance and production of their wares, driven largely by consumer demand. We, as a nation, are caring more about not just what we eat and drink, but how it is made and where it comes from. With this a natural interest in local, small scale producers is awakened. Products made by hand, from natural ingredients are increasingly becoming the preferred alternatively to mass-produced industrialised brands. Such is this interest that specialised gin sales over the past 12 months have increased to the tune of 150%. In global terms though this is merely a drop in the ocean – it is certainly not the case that any mainstream brands are suffering as a result of the recent success of smaller entrepreneurs. There is more to the craft-distiller than just producing small batch spirits though. A few pioneering individuals are making a real impact to the interest of the public in spirit production, and awareness of production methods and provenance is undeniably increasing. As the public become better educated, so they can make better choices in their drink selection, and that’s a scenario in which everyone wins. Awesome Blog Will! Always enjoy reading this. Thanks Maya, glad you enjoy it!